Gaza City, Gaza Strip -- No one feels the suffering of Gaza’s people except the actual victims. It seems that only the person who has been injured feels injury. Only the dead suffer in death. Only those who lose their homes experience the loss. The images of children being killed by tons of iron and gunpowder have become a political goal. No matter the size of our grief, it remains small compared to that of the actual victims who have been injured, have lost loved ones or no longer have a home. What Israel is doing to the civilians of Gaza is shocking -- indiscriminate shelling and killing, destruction of entire residential buildings with occupants inside. They say that death by bombing is painless, but no one knows from where death will come. There is no safe place for you or your family. You wonder why planes and shells are trying to kill you as you sit with your family. Why are they killing your children in front of you? Killing you in front of them? Killing all of you, leaving no witness to your final moments? In the first week of the war, the media followed the story of Shaima al-Masri, 4. The only family she has left is her father Ibrahim al-Masri. Sitting next to his daughter, who lies in a bed in al-Shifa Hospital, he said, “I thought that sending my wife to her sister’s home will make her safe. But minutes later, I heard the explosion. I ran down the street, then I received a phone call that my son had been martyred. At the hospital entrance, I was told that my wife was martyred. I found my eldest daughter, Asil, in critical condition. She woke up for a few seconds and asked me where her mother was, but then she died in the operating room … I later went to where they got martyred and found that a plane had targeted them 10 meters before they reached the house of my wife’s sister.” Shaima’s mother, Sahar, her brother, Mohammed, 14, and her sister, Asil, 17, all died in an Israeli air strike in the northern Gaza Strip on July 9. I returned to al-Shifa, looking for the wounded from the al-Salam residential building. I was informed, “There are no wounded. All of them arrived dead.” Less than a day later came the Khuza’a disaster and the indiscriminate shelling of Khan Yunis -- a new Shajaiya. I entered the pediatric surgery room, where I found a child named Louay Siam, 9, entirely wrapped in bandages. His face and head were burned, but you could still see his tears. His brother Uday Siam, 12, lay in the next room with burns so severe his bones were exposed. Abu Zeid Abu Nasser, a neighbor of the Siams, said, “Uday and Louay's father is a seller of fruits and vegetables that come from Israel. He has nothing to do with any political party … I don’t know why the plane bombed them … They've (the Israelis) gone crazy." In our new apartment, you can hear the sound of the sea mixed with the sound of Israeli drones crossing the sky. Israel's warships fire shells. It’s dark everywhere. The electricity has been out since Israel hit the main station on July 23. On our battery-powered radio, we heard Khaled Meshaal, head of Hamas's political bureau, saying, “We will not accept a truce without achieving our conditions.” My heart sank, and I got ready for another day of counting new casualties. The blockade on Gaza has tightened further since last year and this has worsened the toll on Gaza's population. In Gaza, people suffer from hunger, thirst, pollution, shortage of medicines, electricity, and a lack of any means to get an income, not only by being bombed and shelled. Power crisis, gasoline shortage, water and food scarcity, sewage outflow and ever decreasing resources are disasters caused directly and indirectly by the siege. Gaza has been blockaded by sea and land since 2006. Any individual of Gaza, including fishermen venturing beyond three nautical miles of the coast of Gaza, faces being shot by the Israeli Navy. No one from Gaza can leave by way of the only two checkpoints, Erez or Rafah, without special permission from the Israelis and the Egyptians, which is hard to come by for many, if not impossible. People in Gaza are unable to go abroad to study, work, visit families, or do business. 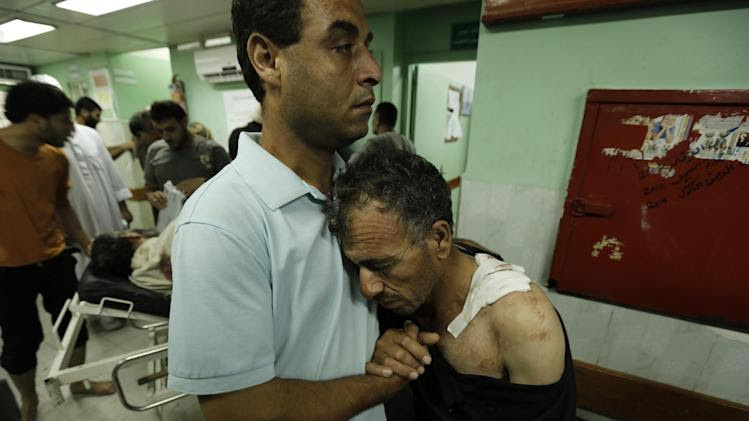 Wounded and sick people cannot leave easily to get specialised treatment outside Gaza. Entries of food and medicines into Gaza have been restricted and many essential items for survival are prohibited. Before the present assault, medical stock items in Gaza were already at an all time low because of the blockade. They have run out now. Likewise, Gaza is unable to export its produce. Agriculture has been severely impaired by the imposition of a buffer zone, and agricultural products cannot be exported due to the blockade. 80% of Gaza's population is dependent on food rations from the UN. According to Gaza Ministry of Health and UN Office for the Coordination of Humanitarian Affairs (OCHA), as of July 21, 149 of the 558 killed in Gaza and 1100 of the 3504 wounded are children. Those buried under the rubble are not counted yet. As we write, the BBC reports of the bombing of another hospital, hitting the intensive care unit and operating theatres, with deaths of patients and staff. There are now fears for the main hospital Al Shifa. Moreover, most people are psychologically traumatised in Gaza. Anyone older than 6 years has already lived through their third military assault by Israel. The massacre in Gaza spares no one, and includes the disabled and sick in hospitals, children playing on the beach or on the roof top, with a large majority of non-combatants. Hospitals, clinics, ambulances, mosques, schools, and press buildings have all been attacked, with thousands of private homes bombed, clearly directing fire to target whole families killing them within their homes, depriving families of their homes by chasing them out a few minutes before destruction. An entire area was destroyed on July 20, leaving thousands of displaced people homeless, beside wounding hundreds and killing at least 70 --this is way beyond the purpose of finding tunnels. None of these are military objectives. These attacks aim to terrorise, wound the soul and the body of the people, and make their life impossible in the future, as well as also demolishing their homes and prohibiting the means to rebuild. Weaponry known to cause long-term damages on health of the whole population are used; particularly non fragmentation weaponry and hard-head bombs. We witnessed targeted weaponry used indiscriminately and on children and we constantly see that so-called intelligent weapons fail to be precise, unless they are deliberately used to destroy innocent lives. As we write, other massacres and threats to the medical personnel in emergency services and denial of entry for international humanitarian convoys are reported. We as scientists and doctors cannot keep silent while this crime against humanity continues. We urge readers not to be silent too. Gaza trapped under siege, is being killed by one of the world's largest and most sophisticated modern military machines. The land is poisoned by weapon debris, with consequences for future generations. If those of us capable of speaking up fail to do so and take a stand against this war crime, we are also complicit in the destruction of the lives and homes of 1.8 million people in Gaza. We register with dismay that only 5% of our Israeli academic colleagues signed an appeal to their government to stop the military operation against Gaza. We are tempted to conclude that with the exception of this 5%, the rest of the Israeli academics are complicit in the massacre and destruction of Gaza. We also see the complicity of our countries in Europe and North America in this massacre and the impotence once again of the international institutions and organisations to stop this massacre. On behalf of 24 signatories. At least 19 Palestinians were killed and about 90 injured early on Wednesday when a UN school sheltering people was hit by shells during a second night of relentless bombardment that followed an Israeli warning of a protracted military campaign. Gaza health officials said at least 43 people died in intense air strikes and tank shelling of Jabaliya, a neighbourhood of Gaza City. The death toll included the people at the school who had fled their own homes. Bombardment from Israeli gunboats continued without respite for much of the night. The last two nights have seen the most fierce bombardment in this Gaza offensive. In 23 days more than 1,240 Palestinians, most of them civilians, have been killed. 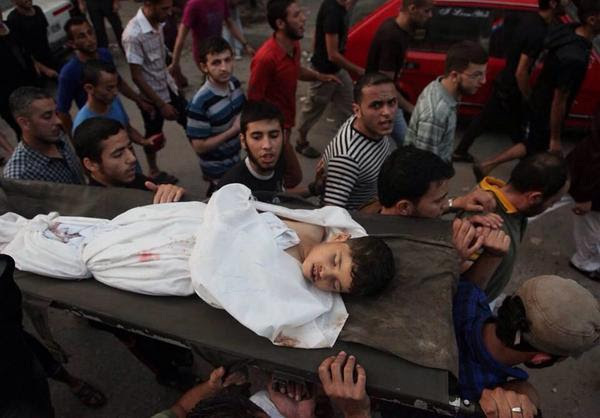 On the Israeli side 53 soldiers and three civilians have been killed. A spokeswoman for the Israel Defence Forces said the military was investigating reports that a UN school had been struck. Last week 15 people died and about 200 were wounded when another UN school in Beit Hanoun was hit as the playground was filled with families awaiting evacuation amid heavy fighting. Israel denied it was responsible for the deaths, saying a single “errant” shell fired by its forces hit the school playground, which was empty at the time. But according to testimonies gathered by UN staff, an initial shell was followed by “several others in the close vicinity of the school within a matter of minutes”, spokesman Chris Gunness said. Reporters who visited the scene minutes afterwards said damage and debris was consistent with mortar rounds. "At least the Nazis had the decency to kill their victims in secret." I've been carrying this sentence around in my head for a couple of days, cynical of the irony. This is the first genocide we're getting a ringside seat at... the whole world. And nothing to stop them? Yes Tom, many thanks for these -- completely shocking. The routinization of suffering numbs. Each successive atrocity further degrades humanity everywhere. Israel remains aggressively unapologetic. The latest school destruction makes it plain to the IDF that rather than bothering with targeting discriminations (obviously now a blood-drunk crap shoot anyway), it's much simpler to order everyone to move, then, when the UN extends offer of protection, to use the sanctuary as a target. Today the UN officials admitted that they can not ensure the safety of those under their care, because they have no power to enforce such a guarantee; asked whether there were any international body that might help with such enforcement, the UN spokesman said, no. A UN spokesman went on tv to attempt to explain the situation to the public. He broke down, and could be seen weeping in the studio. About 3,300 people have squashed into Jabaliya Elementary A&B Girls' School since the Israeli military warned people to leave their homes and neighbourhoods or risk death under intense bombardment. Classroom number one, near the school's entrance, had become home to about 40 people, mostly women and children. Pierre Krahenbuhl, commissioner-general of the UN agency for Palestinian refugees, UNRWA, said the shelling of the school was a "serious violation of international law by Israeli forces". Krahenbuhl said: "Last night, children were killed as they slept next to their parents on the floor of a classroom in a UN-designated shelter in Gaza. Children killed in their sleep; this is an affront to all of us, a source of universal shame. Today the world stands disgraced." Krahenbuhl added: "Our staff, the very people leading the humanitarian response, are being killed. Our shelters are overflowing. Tens of thousands may soon be stranded in the streets of Gaza, without food, water and shelter if attacks on these areas continue." All praise to you, Tom, for your honesty and inspiration and the exceptional quality of your blog. Thank you. Thank you, Fey. The energy flags, the inspiration remains -- strictly a side-stream effect. One can't follow the reports of the Al Shifa medical staff without feeling how much, as professional caregivers, they have been affected. To them and to a handful of reporters, all risking their lives all the time, we owe what small fraction we have of the full knowledge of these horrors. What we do with that small bit of knowledge is of course up to us. Feelings of total inadequacy, humility, despair, shame, frustration, hopelessness, but not yet of a need for submission to the cheap slogans and manufactured lies. I look at these images and then I watch the clips of Regev delivering his set pieces to the media: the same lines again and again, words dropped into sleeping ears. I'm not sure their incantations are working as well as they used to (they work well enough to let the murder go on).